The all-new Dragon Professional Individual, v15, a smarter next-generation speech recognition solution empowers busy professionals to complete documentation and reporting quickly and accurately on the PC, so you spend more time on activities that boost the bottom line. KnowBrainer 2017 (the worlds #1 selling third-party command utility) which makes Dragon / Dragon Medical both easier to use and more efficient. Dragon Installation and Training Flash Drive - 16 Gb USB 3 Flash drive containing any Dragon product full installation, Installation / Training Manuals, KnowBrainer command software and KnowBrainer knowledge base. We also recommend keeping a copy of your user profile on the flash drive and include instructions to do so. Note: Dragon does not come with a microphone, recommended microphones can be found by clicking here. The all-new Dragon Professional Individual, v15, a smarter next-generation speech recognition solution empowers busy professionals to complete documentation and reporting quickly and accurately on the PC, so you spend more time on activities that boost the bottom line. Leveraging the latest in Deep Learning technology, Dragon constantly learns and adapts to your unique voice and environmental variations—even while you’re dictating—to deliver new levels of personalized accuracy and productivity. Robust transcription, powerful customization, and the ability to seamlessly sync with the Dragon Anywhere mobile dictation solution extend the benefits of speech recognition to meet your unique business needs wherever your job takes you. Dragon Professional Individual, v15 expands the possibilities of speech recognition innovation with a next- generation speech engine. Dragon uniquely brings consistent, optimal accuracy to the PC with Deep Learning technology and adaptation techniques that continuously adjust to your voice or environmental variations even while you’re dictating. Dragon eliminates barriers to productivity and creativity by letting you interact with your computer by voice. It turns your spoken thoughts into text and your voice commands into action so you don’t have to worry about the mechanics of typing and spelling. You can easily switch between keyboard, mouse and voice so you can use the mode of input you prefer for any given task. Dragon not only lets you dictate up to three times faster than typing, but it also allows you to make edits and apply formatting using your voice. You can select text and apply formatting such as bold, underline, capitals and more, or just speak to make needed changes. Smart Format Rules automatically adapt to how you want abbreviations, dates, phone numbers, and more to appear, so you don’t have to correct them every time. Dragon gives you robust voice command and control as well as Enhanced Dictation (or Full Text Control), for fully voice-driven editing and command capabilities within many popular business applications that you use every day. Create documents such as reports, emails, forms and notes, and zip through computer tasks in record time. Dragon Professional Individual easily learns acronyms, proper names and other unique or business-specific phrases that you frequently use so it captures your unique words the way you want. In addition, you can import and export your custom word lists. 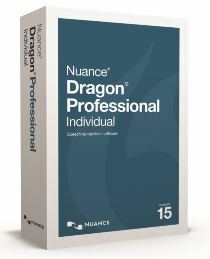 Dragon Professional Individual supports Nuance-approved digital voice recorders and smart phones for advanced recording functionality and can automatically transcribe the audio files to text back at your PC. It leverages all the accuracy improvements gained from the state-of-the-art speech recognition engine for fewer post-corrections. The transcription process features a fully streamlined setup for your own voice. Because acoustic and language model adaptation are automatically leveraged for the current user, no special training is required. You can also accurately transcribe another single speaker’s voice from pre-recorded audio files or from podcasts. No additional training is also needed to transcribe third-party speakers, so you can complete transcription quickly and accurately. Depending on your preference, you may take notes by recording your voice into an audio device for later transcription, or you can work with the Dragon Anywhere mobile app for immediate, professional-grade dictation. Dragon Professional Individual lets you work the way you want to optimize your productivity while on the road. Dragon Anywhere is a separate, cloud-based solution that provides continuous dictation capabilities, letting you create and edit documents of any length by voice directly on your iOS or Android device. It adapts to your voice and terminology so you can dictate, edit, navigate and format quickly and accurately within your document--using your own customized words, shortcuts and commands—from anywhere, at any time. You can share documents and sync custom words and commands with Dragon Professional Individual for seamless productivity wherever your job takes you. Gain immediate access to your dictation so can spend less time behind a desk completing administrative tasks and more time contributing to your bottom line. Dragon is optimized for popular form factors such as portable touchscreen PCs so you can experience new levels of documentation productivity on the go. It’s great for today’s new PCs including highly mobile devices with hybrid touch and keyboard interaction modes. Dragon’s text-to-speech capability is a natural-sounding synthesized voice that reads designated text to you, thereby simplifying proofreading and supporting new levels of multi-tasking. With Dragon Professional Individual, you can also listen to audio playback of your own dictation with the associated text highlighted on the screen. Dragon Professional Individual supports Section 508 standards to eliminate barriers for individual workers with disabilities that limit their ability to use a keyboard and mouse. In addition, it helps prevent fatigue and repetitive stress injuries by offering a comfortable, ergonomic alternative to the keyboard and mouse. Dragon Professional Individual makes it easy to get started with speech recognition and to become proficient quickly with regular use. It’s also simple to explore more advanced features that can boost your productivity even further. Dragon delivers an improved user experience that makes powerful features easier to discover and use. The enhanced transcription process leverages all the accuracy improvements gained from the state-of-the-art engine, while reducing the number of steps required to getting your audio recordings transcribed. Transcription of third-party speakers may require an additional license for each unique speaker. Review Description: Dragon gets better as it grows. We only wish that online support grew with it.